Micro-blading is a form of cosmetic tattoo artistry that involves manually implanting pigment into the skin, to produce crisp hair strokes that perfectly mimic a natural brow hair. Eyebrow Embroidery & 3D Hair Stroke methods are all forms of Microblading. It is done using an extremely fine and precise manual blade. This course focuses on mastering the micro-blading technique step-by-step and is designed for both beginners and experienced artists who want to sharpen their skills. Learn tinting techniques from the RefectoCil Canadian representative. The instructor will teach you how to properly use the premium RefectoCil tints for maximum performance results and maximum salon profit, learn proper protocol, colour matching and mixing, complete and compliment any look and style and benefits to your business and customers. The course objective is to teach creative brow style, emphasize the importance of eyes while creating a total look, implement Refectocil branding including fashionable and premium quality and prevent the use of hair colour on brows. PPD Free and based on plant extracts, RefectoCil sensitive is the perfect range for your customers with sensitive eyes and skin. The application is quick – only 3 minutes and very easy as it does not require any mixing or measuring! Satin Smooth Waxing Training course will provide you with all the key knowledge you must know when providing waxing services. Satin Smooth is a superior quality group of waxes. All individually formulated for all skin types and waxing needs. Basic facial and full body will be taught by Forma’s Educator Lana Burgoyne. Lana has been esthetian and educator for 20+ years. Both training sessions will have hands on education, as well as health and safety training. Lana Burgoyne, she’s been since 1995 so over 20 years. Satin Smooth is a superior quality group of waxes. All individually formatted for skin types and waxing needs. The Satin Smooth Waxing classeswill provide you with all the key knowledge you must know when providing waxing services. The MICHA Lash Certificate course consists of 2 training days plus an exam date. Students are taught everything necessary in order to be confident and comfortable while applying eyelash extensions. 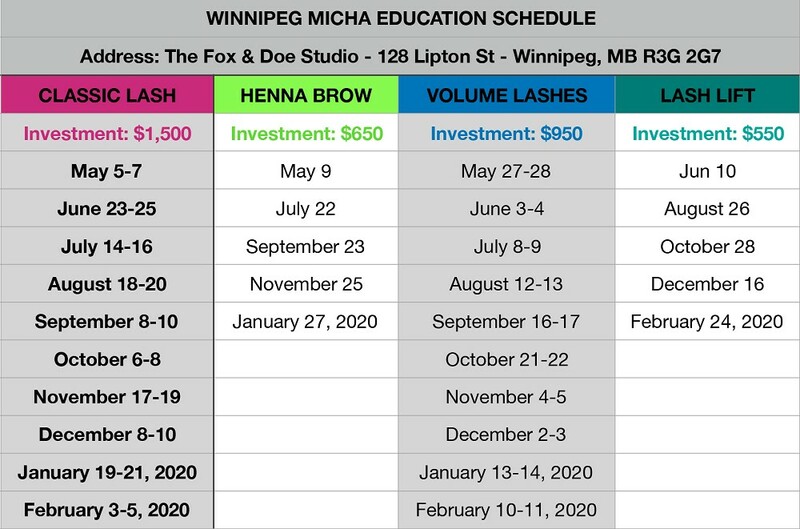 They will also be able to learn how to maximize their profit potential, learn how to apply specialty lashes such as coloured lashes, use crystals to create signature looks, and how to properly protect their clients with proper infection control procedures. Take advantage of this increasingly popular service and become the leaders in the Beauty Industry. We require a $300 deposit which covers a part of your starter kit that is included. You will be required to do at least 4 models and take before and after pictures then submit then send them to us. En Vogue is the hottest and fastest growing trend in nails and beauty- Sculptured Gel Nails! We offer a comprehensive course preparing you to work with clients and start your career or business. Our mission is to provide and ensure superior educational training in the technical and practical field, successful manufacturing of a unique and superior product, to be the leader in nail systems with a dedication to professionalism and excellence, to offer continuous support, guidance and encouragement to all who strive for higher levels of achievement. Upon successful completion of Levels 1-3, you will receive your certification and will be able to build and service a clientele with confidence which in return, will provide you with the opportunity to have a successful business with an attractive income. Whether you are a salon manager or starting up your own business this START UP/SALON MANAGEMENT COURSE consists of one day training to help you with all topics on Salon Operations, Financials and Marketing. This course will brush up your cash flow management, taxations, insurances, new media marketing and much more. Jeff Alford (Chief Executive Officer of Global Financial Partners) is a management accounting and tax specialist with more than 40 years of experience. He also brings a full range of business operation and analytical experience, including managing and restructuring businesses. Jeff also has 25 years of specialized experience in the beauty distribution business. Contact Forma at (807) 622-7277 for dates! Contact Forma at (807) 622-7277 to register!